There is more than one band with this name. 1. Five (formerly styled 5ive) were a British boy band formed in 1997, created by the two men who had created the Spice Girls - Bob and Chris Herbert. The five lads - Richard 'Abs' Breen, Jason 'J' Brown, Ritchie Neville, Scott Robinson and Sean Conlon - were the five members picked from over 3,000 hopefuls at auditions in early 1997. They went on to have ten top 10 hits in the UK and three number 1's, and enjoyed marginal success worldwide, particularly in parts of Europe and in Australia. Five disbanded on 27 September 2001. 1. Five (formerly styled 5ive) were a British boy band formed in 1997, created by the two men who had created the Spice Girls - Bob and Chris Herbert. The five lads - Richard 'Abs' Breen, Jason 'J' Brown, Ritchie Neville, Scott Robinson and Sean Conlon - were the five members picked from over 3,000 hopefuls at auditions in early 1997. They went on to have ten top 10 hits in the UK and three number 1's, and enjoyed marginal success worldwide, particularly in parts of Europe and in Australia. Five disbanded on 27 September 2001. In 1997, an advertisement was placed in the UK performing arts newspaper The Stage, asking for young male singers/dancers to audition for a boy band-style group with "attitude and edge". Bob and Chris Herbert, the two men who had earlier created the Spice Girls, thought the time was right for a male group. Three thousand hopefuls auditioned and they were finally narrowed down to only fourteen, five of whom had arranged themselves into a group while waiting for their audition and subsequently were signed with BMG/RCA for a six-album deal. In November of 1997, the band released their first single in the UK, "Slam Dunk (Da Funk)", which debuted at #10. The song was also released in the US in 1998 but had little chart success, although it was chosen as the new theme song by the NBA. In 1998 Five earned their first major international hit, "When The Lights Go Out", which cracked the US top 10 and earned Gold status there soon after. Five then went on an eight-day tour to promote their upcoming album, appearing in a concert special for the Disney Channel with Irish girl group B*Witched, in Times Square in New York City, and on MTV's TRL. The debut album peaked at #27 in the US, and topped the charts in other countries worldwide, including the UK. "It's The Things You Do" was released in late 1998 in the US, only to receive a lukewarm reception. The group embarked upon a US tour with boy band *NSYNC, but soon after pulled out due to exhaustion, flying back to England to rest and start work on a new album. Still mining the first record, "Got The Feelin'", "Everybody Get Up", and "Until The Time Is Through" were all released as singles throughout 1998. Reaching the top 5 in different countries around the world, the latter two singles each rose to the number two spot in the UK, and Five had well and truly made their mark in the world of boy band mania. In August 1999, the first single of their second album, the catchy dance tune "If Ya Gettin' Down", was released and became a major hit worldwide but yet again failed top go to #1 in their home country, kept out of the top spot by Ricky Martin. Finally in October 1999, after three consecutive number-two peaks, "Keep On Movin'" became their first UK #1, as well as their biggest selling single to date. The second album hit the top five shortly thereafter. "Don't Wanna Let You Go" was released in early March 2000, peaking at #9. On March 3, 2000, Five opened at the BRIT Awards with rock legends Queen, performing an updated version of that band's hit, "We Will Rock You". 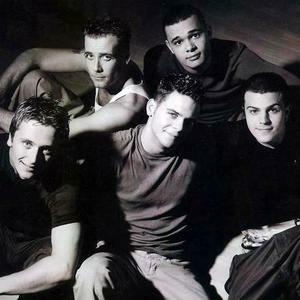 That night Five won their first BRIT Award, as "Best Pop Act", and their cover of the Queen song went on to become their second #1 in the UK in July 2000. The first half of 2000 found Five on a successful world tour, performing concerts in the UK, Europe, Russia, Australasia and?as a foursome?South America, after band member Ritchie contracted Chicken Pox and had to be flown back to England. After finishing the tour, the group continued to perform at many concerts in the UK, including Party in the Park with Queen. A re-issue of their album Invincible included remixed versions of a couple of songs and five live tracks from their tour, as well as a bonus track, "Don't Fight It Baby". Due for release in July 2000 in the US, the song was pulled from release after the group was dropped by their stateside label, Arista Records. Five also had problems with their Asian record company, and subsequently cancelled their Asian tour. Suffering from this major blow, the lads headed back to the studio and started writing songs for their next album. They continued to win awards in the UK and Europe, and in December 2000 launched their second big tour, in their home country. In January 2001, Five went to perform at one of the biggest festivals in the world, "Rock In Rio" in Rio de Janeiro and Caracas, to an audience of almost half a million people. In May 2001, after many months of creative writing and "developing their own personal sound," Kingsize was completed. When it was time to begin filming the video for the debut single off the album, however, band member Sean had fallen ill with glandular fever. The "Let's Dance" video was released with a life-size cardboard cut-out standing in for the ailing singer, and rumours that he had in fact left the band had to be quashed. Scott also temporarily left the band for a few weeks to be with his his then-fianc?e Kerry Oaker, who was having troubles with her pregnancy. Their son, Brennan Rhys, was born on July 11, 2001, five weeks premature. The remaining three members, J, Abz and Ritchie, pressed on with heavy promotion of the group's third album and the "Let's Dance" single. Whilst performing at a concert in Belgium in July, Ritch ripped the tendons in his left foot, putting a halt to all promotion and prompting the group to have a few meetings to re-think their options and future. "Let's Dance" was released in mid August 2001, however, and became their third UK #1, holding the top spot for two weeks. Kingsize debuted two weeks later at #3, going on to achieve Gold status. After a month of serious meetings with record management, Five came to the decision that they were "calling it a day", and the group disbanded on September 27, 2001, via an announcement on MTV Select. On September 28, a day after the announcement, Scott married his childhood sweetheart, Kerry Oaker, at a ceremony which all the lads attended. In November 2001, "Closer To Me", featuring rare footage of the band, and "Rock The Party", with an animated video, were released as a double-A-side single. A greatest hits album followed. In the band's short life-span, they experienced success around the world, racking up three number-one singles in the UK and selling an estimate of 15-20 million records worldwide, including 7 million albums worldwide and two million in the United States, and picking up numerous awards along the way. In November 2001, Five member Abs went to Australia for the major pop festival Rumba! and performed on stage with boy band Blue. About a year after the breakup, he enjoyed a brief but fairly successful solo career, releasing the album Abstract Theory in 2003, which produced three top 10 singles in the UK. Ritchie Neville and Sean Conlon also initially attempted solo musical careers which seemed to stop almost before they began, although Ritchie has made occasional appearances as a TV guest star, presenter, actor and reality show celebrity contestant. Scott Robinson joined a local Essex radio station, EssexFM, in 2002 for a few months as a radio DJ. He starred in the UK regional theatre musical Boogie Nights 2 from late 2004 through most of 2005. Scott also became a father for a second time, with the birth of his second son on September 13, 2006.. J Brown had all but disappeared from public view for nearly 4 years but has recently resurfaced as a writer and producer. Sean Conlon ultimately became the second group member to sign a solo recording deal, with Sony, and began work toward a new album. On September 17, 2006, an announcement was made via Five's official MySpace page that a press conference was to be held at The Scala in central London, England, on September 27, 2006, at around 11am GMT. After a venue change due to a shooting at The Scala, the conference was moved to the Bar Academy Islington. It was rumoured that four of the five members would be reuniting (Sean now being committed to his Sony deal), and this was confirmed at the press conference. Five recorded new material for what was to be their fourth studio album, working with Guy Chambers, Swedish producer/songwriter Anders Bagge, and French DJs Trak Invaders, and also planned to tour in 2007. As of January 2007, Five had completed half of their album and were looking to sign up to a record company. The album was expected to be released within the next few months. On March 8, 2007, at midnight, Five premiered one-minute clips of two brand new songs that were to have been on the new album. The songs, titled "70 Days" and "Settle Down," can be heard on the band's official webpage and also on their MySpace page. Only 7 months after reforming, having failed attempts at securing a record deal, Five announced on May 20, 2007, via their official website that the group will no longer be pursuing a comeback. 2. Five is also the name of a german jazz group. Members are Matthias Bergmann flgh (K?ln), Volker Winck (Volker Winck Quartet) ts, ss (Osnabr?ck), Christoph Busse p (Hannover), Gerold Donker b (Hamburg) and Thomas Hempel dr (Oldenburg).